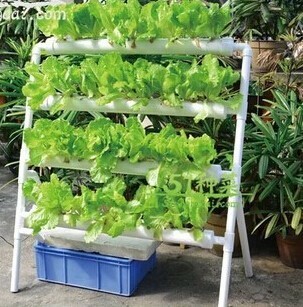 Hydroponics is the ideal method to grow plants in urban areas. It makes a wonderful hobby that helps you relax and it is fun to your watch plants grow in NFT hydroponic System.Hydroponic nutrient is fed on the top of the high end of the channel and allowed to flow over the roots after which it drains into a nutrient reservoir. It is then re-pumped back into the channel to repeat the watering process. An ‘intermittent’ feed cycle is regulated by a timer and repeated many times per hour. This system achieves better aeration of roots because roots are exposed to air between each feed. With 36 planting locations per set it is great for growing flowers, herbs, succulents, peppers, and much more.Grow indoors or out. Backyards, Greenhouses, Kitchens, Balconies and much more.Can be Used in Aquaponic Systems also.